It’s a new year, but the rent vs. buy a home argument hasn’t gone away, or become any clearer. It’s always a complicated decision, with or without confusing tax changes. At the same time, it’s a personal question with a very subjective answer, dictated by your own unique situation coupled with your locale. In other words, this post won’t provide a simple “yes” or “no” at the end to put you at ease. You have to do your homework and determine why it is you want to buy a home in 2018 as opposed to continuing to rent. 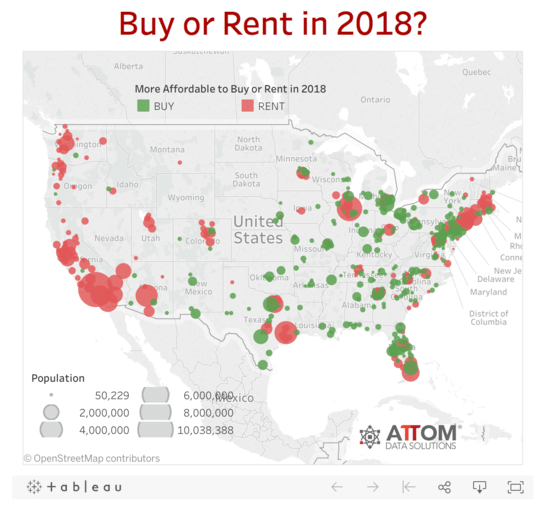 Here’s what we know now, according to the 2018 Rental Affordability Report from ATTOM Data Solutions. The median-priced home in 240 out of 447 counties nationwide is more affordable than renting a three-bedroom property. On the surface, that sounds kind of good, maybe? But are you currently renting a three-bedroom home? Doubtful. You’re probably in a one- or two-bedroom apartment. Secondly, where are these 240 counties where buying a home is more favorable? Well, that’s the rub. If you look at the map above, you’ll notice a lot of giant red circles, and a scattering of smaller green ones. As you may have guessed, the red bubbles indicate that it is better to rent than buy, while the green dots are giving you the all-clear on going for that home purchase. Here’s the problem with that seemingly favorable slant toward renting. Very few of the counties seem to be close to major metropolitan areas. For example, in red-hot California, there’s just one county where buying is favored over renting. That county is Kings, otherwise known as the Hanford-Corcoran MSA. The population of this entire county is only just over 50,000, per a 2010 census. And the nearest larger cities are Visalia and Fresno. It’s the same story in most other West Coast states, like Arizona, Oregon, Washington, and so on. You won’t find an affordable county near the major metros. Once you travel to the Midwest, affordability gets much better and a lot of states actually favor buying over renting. And there are even some major metros where this is still the case, such as Dallas and San Antonio, TX, and St. Louis and Indianapolis. Down in Florida, both Miami and Tampa are on the buy side of things, and the same is true in Pittsburgh, Philadelphia, and parts of Washington DC. But ultimately, renting is cheaper than buying a home in the 14 most populated counties nationwide, along with 30 of 39 counties with a population of one million plus. So the first thing you should do is hone in on your local housing market, instead of reading an article that talks about national home prices. The situation can be very different depending on where you live. What’s Your Goal in Buying a Home? Is it because you genuinely need more space? Or want to start a family and create some forced savings? The second thing you need to do is assess what your goal is in buying a home. Do you want to buy a home because you need more space, want something permanent, or plan to start a family? Or do you want to buy a home because you want to turn a profit, or simply don’t want to miss out? If it’s the latter, it might not be the best move, though in truth, both scenarios could well play out nicely the way things are going. Home prices have risen dramatically over the past five years since bottoming out, and are still expected to notch some decent gains in 2018 as well. 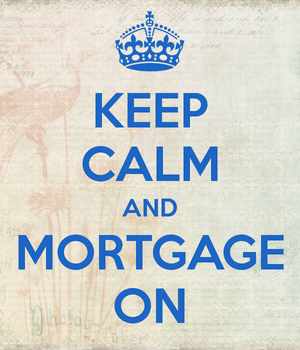 And with mortgage rates still close to bottom, it makes for a compelling buy argument. The question is how much higher can/will home prices go during this cycle before peaking and/or falling? As I’ve said before, I believe today’s housing market is very healthy by historical measures, mainly because most homeowners have really conservative financing in place. We’re talking 30-year fixed-rate mortgages at rates below-market, and many borrowers with lots of home equity thanks to all that recent home price appreciation. Even many of those who were underwater in 2012 are now sitting really pretty, thanks to years of paying down the mortgage coupled with mega price gains. Worried About Buying at the Top of the Market? Until financing takes a turn for the worse, perhaps to accommodate diminishing affordability, the housing market should continue to exude excellent health. And so if you’re worried about buying a home at the top of the market, realize that it might still be years away. Just like the bottoming of the market, which took many years to be fully realized, a top can also play out over a long, extended period of time that defies estimates and expectations. And many don’t even think we’re at that top yet. Once we get to that top, it could be several more years beyond that for another housing crash to actually take place. Regardless, most home buyers shouldn’t concern themselves with such things if they’re purchasing a property for the right reason, which is to position themselves in a stable living situation that also provides for forced savings and accumulated wealth. For the record, ATTOM based the rent vs. buy decision on a median-priced home with a 3% down payment that required mortgage insurance. So the equation could change quite a bit if you come in with 20% and avoid PMI. As noted, you need to look at your specific situation and do the math based on how you’re structuring a potential purchase. Even if the math doesn’t favor buying, it could still make sense if you want a home of your own. There are plenty of intangibles that you simply can’t calculate.